Like any developer, I love any shiny new tech demo that finds its way into my browser; some of the things people are putting together absolutely blows my mind with the level of creativity and technical skill on show. After attending WebDevConf 2012 in mid October, I felt the usual heightened sense of inspiration that a good conference gives us all. On my way back to London, I happened to see a tweet about the current Mozilla Dev Derby in my Twitter stream and, still inspired, thought about creating something to enter myself. That something turned into a tech demo called Media Query Mario; a mash up of Media Queries, CSS3 Animations and HTML5 audio. One question I’ve been asked since putting the demo out is: why choose CSS animations when other technologies may have been more suitable? The main reason is that I simply wanted to see what they could do. There are plenty of demos showcasing just how awesome canvas and SVG are; my demo is by no means meant to advocate the use of CSS animations over those technologies. I just wanted to give a decent benchmark of where CSS animation is at right now, and at least add them to the conversation when people are choosing which technology is right for their project. There was only one rule I set myself when starting to put together the demo – I wanted to stick rigidly to animating using CSS wherever possible. If it was possible to do something in CSS, I wanted to use it, irrespective of performance or how fiddly it was to implement. I’ll come back to how I think it performed in retrospect later. One of the earliest issues I came up against was knowing what width the user would be viewing the animation at. This was not only important in terms of what size to design the animation to, but especially in terms of how much of the level was on show at any one time. The more of the level on show, the more I would need to animate at any one time. Planning the actual animation itself, I wanted to mirror the way the original game would have been played as much as possible. To help with this I found a video clip that traversed through the level at a pace that I could replicate. This helped me plan the image and sound assets I would need, the speed of the animation and started the thinking around how to animate different enemies and power-ups throughout the level. With the structure of the demo planned out, I now just needed the assets. As you might expect, you don’t have to search for too long online to find original game images, sprites and sound files. 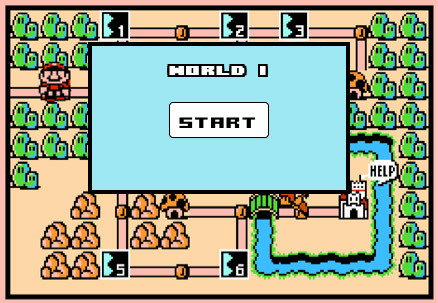 For my demo, I used NESmaps and Mario Mayhem for the level map and character/object sprites and The Mushroom Kingdom for the sound files. I had to do a small amount of image editing myself, but these gave me a really great start. 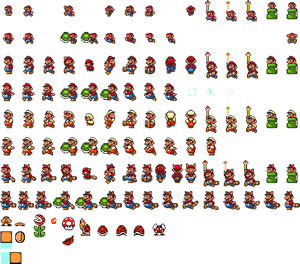 You can view the final spritesheet I used for the animation below. So I had an idea planned out and had found my assets; I was ready to start putting it all together in code. First, I set about learning the specifics of CSS3 animations. A couple of resources really helped me out; MDN is always a great place to start and is no exception for CSS animations. I would also recommend any of these great articles by Peter, Chris or David – all provide an excellent introduction to getting started with CSS3 animations. I won’t look to replicate the depth those articles cover, but will highlight the key properties I made use of in the demo. For brevity, I’ll be covering the CSS3 syntax unprefixed, but if trying any of this out for yourself, prefixes should be included in your code to ensure the animations work across different browsers. A quick development tip worth mentioning when using newer CSS3 features such as CSS animations, is that using a preprocessor, such as LESS or SASS, is a massive lifesaver and something I’d highly recommend. Creating mixins that abstract the vendor prefixes out of the code you are directly working with helps keep visual clutter down when writing the code, as well as saving a whole load of time when changing CSS property values down the line. Before we get into specific techniques used in the demo, we need to understand that an animation consists of two main parts; the animation’s properties and its related keyframes. The use of the animation-fill-mode property was especially important in the demo, as it was used to tell the animation to apply the final rendered styles to the element once the animation had finished executing. Without this, the element would revert to it’s pre-animated state. So for example, when animating an element’s left position 30 pixels from an initial position of 0px, if no animation-fill-mode is set, the element will return to 0px after animating. If the fill-mode is set to forwards the element will stay positioned at its final position of left: 30px. So if the above animation was 1 second long, Mario would move from position bottom: 30px; left: 445px; at 0 seconds (0% through the animation) to bottom: 138px; left: 520px; during the first 200ms (or 20%) of your animation. This carries on like this throughout the keyframes defined. Movement such as Mario jumping or a coin appearing out of a question box. Spriting controls the background-image position of characters and objects in the animation. Looping any animation that is to be repeated for x number of milliseconds or seconds. Movement covers roughly 75% of all of the animations in the demo. For example, this includes character movement (i.e. 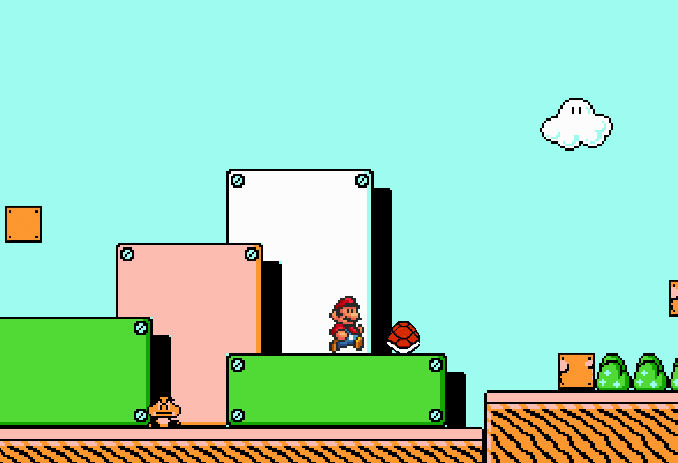 Mario running and jumping), power-ups appearing and question boxes being hit. What makes each movement animation differ is the animation-timing-function, the animation-duration and the animation-delay properties. The animation-timing-function property helps control the speed of the animation over its duration. Wherever possible I used easing, such as ease-in or ease-in-out to save having to be too precise when defining animation keyframes. Where this didn’t create the effect I needed, I resorted to setting the animation-timing-function to linear and using the keyframes to specify the exact movement I required. An example a movement animation can be seen by this jump sequence. To show this in action, take a look at the following examples, which show a simple Mario walking animation and Mario transforming after grabbing a power-up. Using step-end in this way wasn’t completely pain free however. To my frustration, when these sprite animations were stacked up over multiple media queries, I found that there was a glitch in WebKit that caused the animation to render differently to the keyframes I had defined. Admittedly, the use of CSS animations in this way is an edge case for browser rendering, but I have filed it as a bug in Chromium, and am hopeful this will be looked at in the future and ironed out. An example of this from the demo would be the rotation of the fireball]. Through these 3 types of animation, the whole demo was constructed. The final layer was to add in the audio. Although I had previously downloaded all of the sound files I needed in .wav format, I had to convert them into a format that was usable with HTML5 audio; .ogg and .mp3. I used Switch Audio Convertor (on Mac) to do this, but any good audio conversion software should do the job. If you have multiple animationstart events for one element, such as Mario in my demo, you can use a switch statement to handle the animationName that has triggered the event listener. Since writing the demo, I have found that you can also target individual keyframes in an animation by using the Keyframe Event JS shim by Joe Lambert, which gives you even more control over when you can hook into your animation. The response to the demo has been more positive than I’d ever hoped for since it was released. Like any hack, there are things I’d like to go back and improve with more time, but I think it’s more valuable to put what I learned into my next project. I think that the demo has shown that CSS animations can be used to create some amazing effects from fairly simple code, but also brought one bigger issue to my mind while putting it together. Going back to my earlier comment about comparing CSS animations to using canvas and SVG, I think all have a place at the table when discussing what technology to use for animation. However, the sooner the barrier of time spent to craft complex animations like this one can be lowered, the more relevance, and potential use cases, CSS animations will have in the projects that we do. This is awesome! I love how fast HTML5 is improving and how awesome the hacks are. Absolutely awesome Ashley, thanks for the post. Thanks Ash, this is a truly great article that gives me much more of an understanding of the process behind the creation of your experiment & into CSS animations as a whole. I will certainly be referring to this in the future! Awesome! This is an incredible experiment. Thanks for the post. Have you taken a look at SASS control directives such as @each and @for? I often hand code values and extract the algorythms that way. I was using LESS when I started on this demo. I’ve since switched to coding with SASS, and wish I had been using it at the time – especially for the keyframe and multiple animation conversions which I could’ve used @content to really help me out. Like mentioned in the article though – I’d recommend using any preprocessor when working with experimental CSS like this – saves a whole bunch of time. Its really awesome, the developers really do so much tough work for making a game .. so much coding its just out standing work. A very nice post.